Overall beer consumption in the United States may have dropped again in 2017, but Americans still threw back 208 million barrels of beer. That's a buttload of beer. But the kinds of drinks Americans swig are changing all the time. 24/7 Wall St. went through the last year of changes in domestic shipping volume for "26 of the beer industry’s largest brands" using data from Beer Marketer's Insights to show some of the changes inside the beer world. One of the big changes seen below is the growth of Mexican beers like Modelo and Corona. Those two are three of the largest growers year-over-year. They're just behind Michelob Ultra which grew 21.3%. That's the most among the beers listed below, most of which saw a year-over-year decrease. Below, you'll find the top 26 beers according to the data provided to 24/7 Wall St. Also included for the top 10 is beer's volume change from 2016 and its parent company. The latter of the two drives to the heart of "the illusion of choice" often talked about by craft beer lovers. It can look like there are 10 beers on the shelf at your local liquor store, but it's possible they all come from just one or two parent companies. It's important to note this is not a quality judgment on these beers. 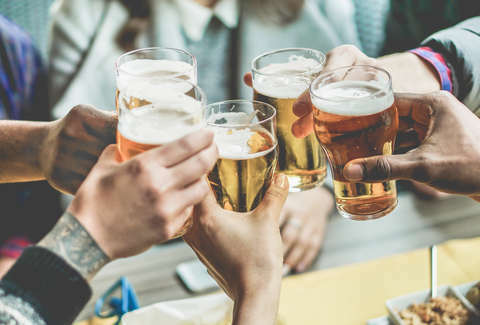 If you're looking for something like that, you might want to check out Zymurgy’s Best Beers in America list, which was topped by Bell's Two Hearted and Russian River Pliny the Elder this year. Other beers round out the top 26 include, starting from number 11, include Heineken, Keystone Light, Miller High Life, Stella Artois, Bud Ice, Pabst Blue Ribbon, Natural Ice, Yuengling Lager, Blue Moon, Dos Equis, Coors Banquet, Steel Reserve, Icehouse, Corona Light, Milwaukee's Best Ice, and Guinness.